How can I access my backed up files? /BigMIND /How can I access my backed up files? From the left side panel, select the computer containing the files you want to view. 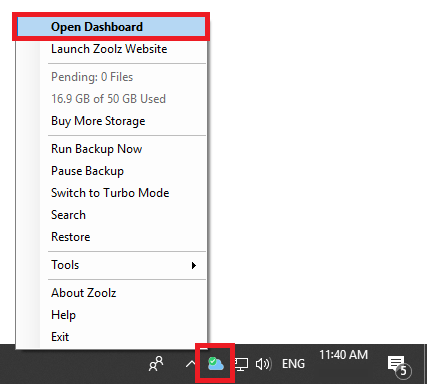 Right-click on the Zoolz agent (icon) in the system tray (Taskbar), and select the Open Dashboard option. From the drop-down menu, select the computer containing the files you want to view. 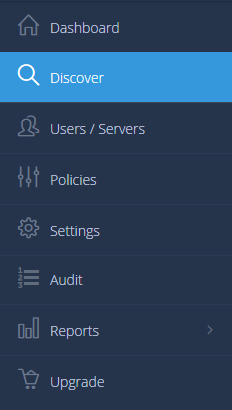 From the left side panel, select the device/service you want to view its data. For more detailed description, please check this article. Download the BigMIND App and install it. Open the BigMIND app and sign into your BigMIND account. Refer to the Discover tab and browse your data from there. 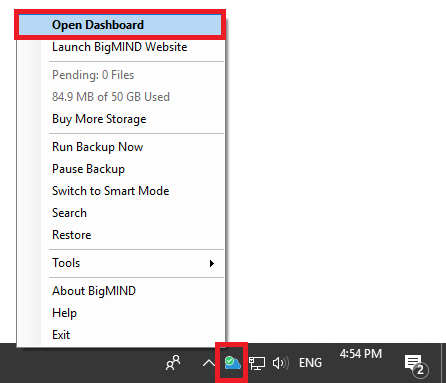 Right-click on the BigMIND agent (icon) in the system tray (Taskbar), and select the Open Dashboard option. From the drop-down menu, select the device/service containing the files you want to view.